In a blink of an eye, it’s time for Bake Along again! 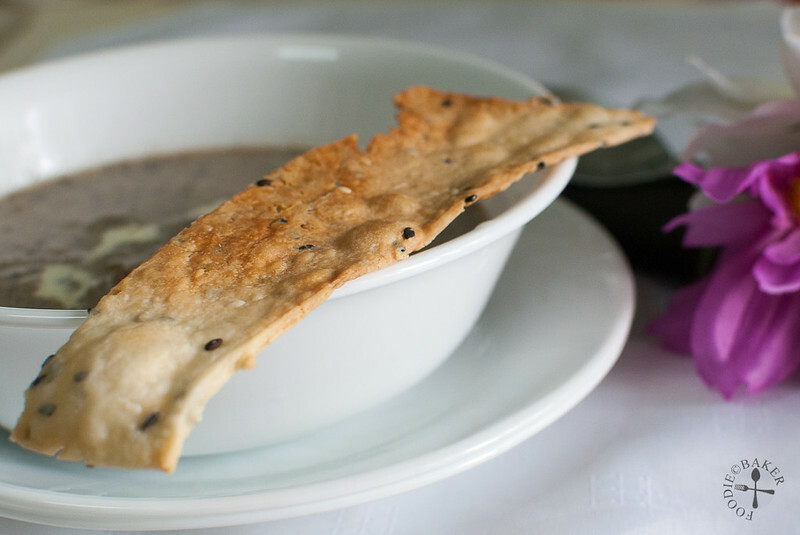 I first had savoury crackers in an Italian restaurant – the crackers were served together with bread as a starter and I was intrigued and pleasantly surprised by the unpretentious, crispy and salty crackers. 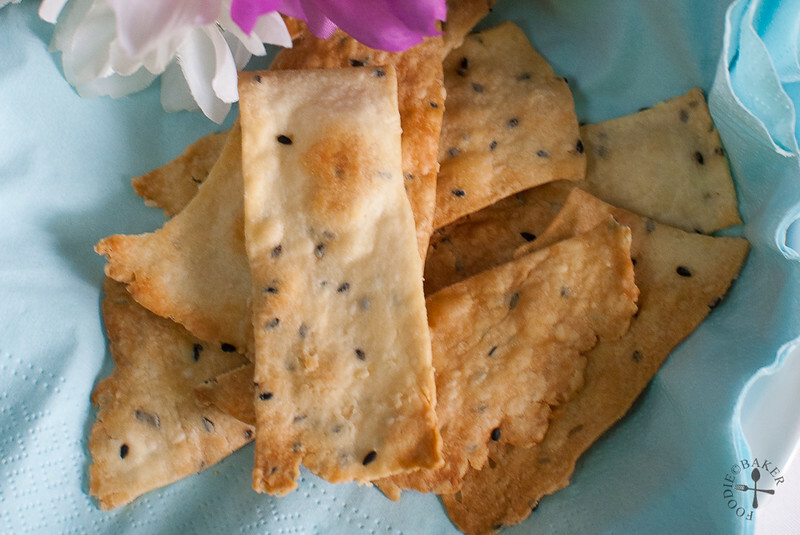 When these savoury crackers were chosen as the Bake Along theme, imagine my excitement! 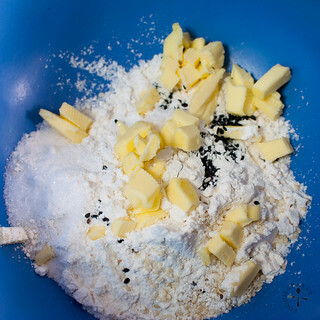 1) Combine all the dry ingredients and butter together. 2) Cut the butter in to get coarse meals. 3) Stir in milk and form a soft dough. 4) Wrap and rest for 1 hour. 5) Roll the dough out as thinly as possible. 6) Bake until the crackers are golden and crispy! Hosted by Lena of frozen wings , Joyce of Kitchen Flavours and Zoe of Bake for Happy Kids! 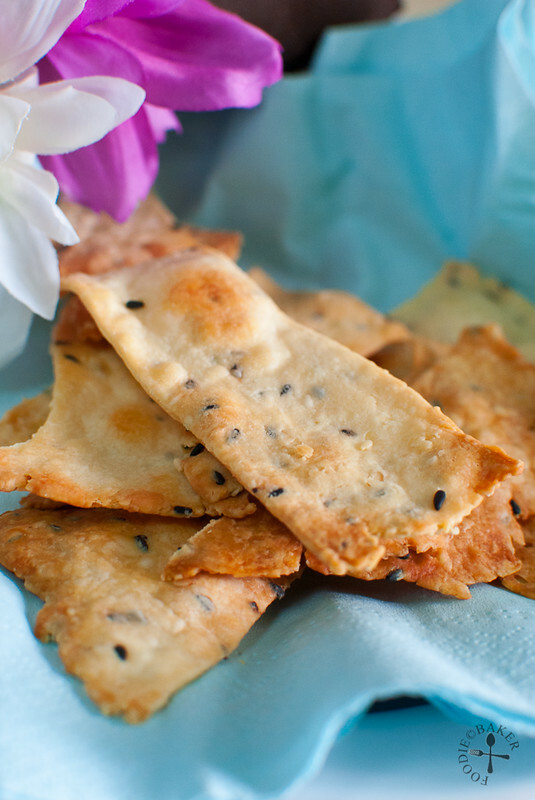 Do click on the froggie above to see other foodies’ bakes on the crackers! 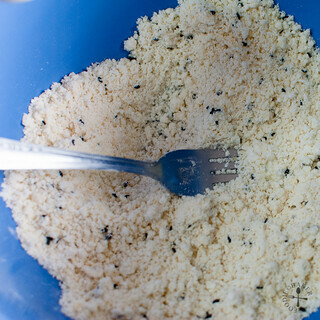 Stir flour, sugar, salt, black pepper and sesame seeds together. Add in the cold butter and cut it in with a pastry blender or a fork (more tedious) or your fingers until you get coarse crumbs. 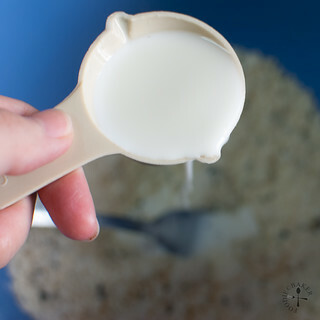 Stir in milk to form into a rough dough and scrape it out onto a clingfilm / plastic wrap. Using your hands, gently squeeze to gather the dough together. If it is too crumbly, add in more milk, teaspoon by teaspoon until you get a soft dough. Press the dough into a disk, wrap it with plastic wrap and rest at room temperature for 1 hour. Unwrap the disk and roll it out as thinly as possible with a rolling pin. Trim the edges and cut into desired shapes. Transfer the dough onto the baking sheet and bake for 12 to 15 minutes until lightly golden and crispy. Let the crackers cool completely before storing in an airtight container. I made 1/4 of the original recipe and substituted the cream with milk; and as milk has a lower fat content, I increased the amount of butter used in the recipe. These crackers need to be rolled out as thin as possible so that it will be light and crisp. If the crackers are not thin enough, you might find that it’s a little tough to bite off. I think I can roll mine even thinner the next time. The crackers are also more salty than sweet, but I found the saltiness of the crackers just nice – probably because I’ve adjusted the amount of salt a little (see Super Naggy Note 1). 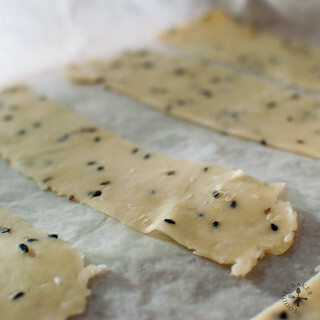 You can also substitute sesame seeds for other type of seeds (e.g. poppy, mustard) or even herbs for a different flavour. From what I’ve observed from cooking shows, I’ve noted that most Western recipes use coarse/kosher salt in their recipes, but most Asian families use table / regular salt in their normal day-to-day cooking. Table salt is finer than coarse salt, hence 1 teaspoon of table salt will be a lot more saltier than 1 teaspoon of coarse salt. When trying out Western recipes, I will cut back the salt listed by about 1/4 to 1/2 (i.e. 1 teaspoon salt in Western recipes = 3/4 or 1/2 teaspoon table salt). To prevent the dough from sticking while rolling out, you can roll it out on a lightly floured counter with a lightly floured rolling pin. Another method (which is what I used) is to place the dough on a large piece of clingfilm / baking parchment, cover with another piece of clingfilm / baking parchment and roll it out with the rolling pin. 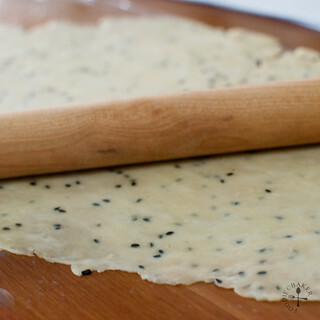 This way, there is no need to go through the trouble of flouring the counter / rolling pin and you can also use the clingfilm / baking parchment to transfer the crackers onto the baking sheet easily. 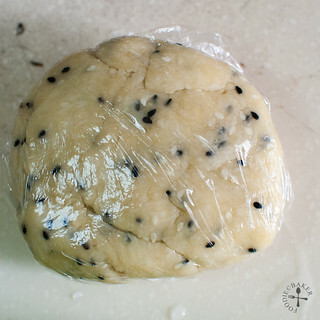 The temperature in Singapore is really warm, so if you leave the wrapped dough out for 1 hour, you will find that the butter will start to melt and ooze out of the dough. However, if you roll it straight from the refrigerator, the dough will be really hard and you might end up with cracks here and there. Let it rest at room temperature for 10 to 15 minutes to soften slightly before rolling it out. I realise too that the crackers shown at william sonoma website and the book are super-thin and hollow with lots puffiness! I reckon over-mixing the dough can reduce the puffiness of these crackers? You think? Look really nice your crackers. It was great to bake along. Can’t blame your mom for finishing it! Look so crispy and delicious! I would love to have these with a nice soft cheese or as you said a creamy soup. I can see how they would be totally addictive. hi jasline, so glad to hear that these crackers turn out delicious for you. I enjoyed eating these crackers a lot too, now that i hv read your notes, i now suspect maybe becos i have used coarse sea salt that’;s why mine didnt turn out to be as too salty. yup, eating with soup or like zoe’s ones, dipped with hummus are excellent ideas! Your crackers looks thin and crispy to me! Yes these are rather addictive, even though I find them a little salty, but I find myself reaching for another one! Glad that you could bake along with us! I think yours looks really crispy and nice and yes, eating it with creamy soup sounds delicious!